There are a few individual characters that make up the entire automata piece "Fishing". These are two of them. Gertrude and Heathcliff are two seagulls that are perched on the dock. Their names are taken from two characters created by the comic Red Skelton. They are looking for an opportunity to steal a snack, a worm, a fish, a french fry, a minnow, or whatever might be lying around. They keenly observe the fishing operations hoping for a treat. 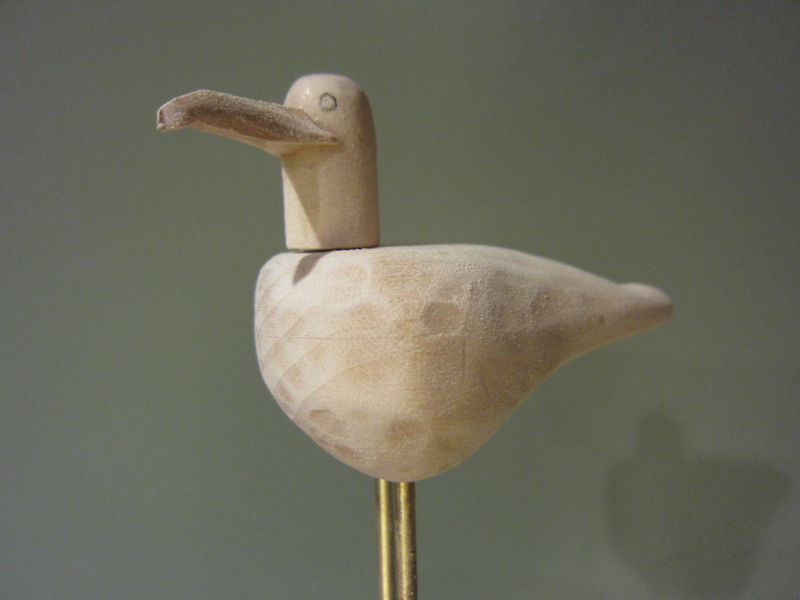 The seagulls are made from two pieces of basswood and a piece of dowel. This small bent rod in this photo is the actuator that runs up inside the leg. 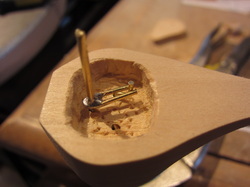 The large rod will be connected to the head through the top of the body. After the internals are installed the body is reassembled and shaped and a solid leg the same diameter as the tube is installed. A basswood beak is added and the head is pushed down onto the protruding brass rod. Now he just needs paint. ​Click here to return to the "Fishing" webpage.